GORKHA, Oct 24: Thousands of people who left for their hometowns during Dashain have started returning to the capital after receiving Tika and blessings from their elders. Unfortunately, they have had to go through lots of hassles due to less number of vehicles. Usually, people return to the Valley or get back to work after the 15th day of Dashain. But some do not have that option due to strict work schedule and studies. These people have no option but to hitch-hike from trucks, tippers, tractors and jeeps. 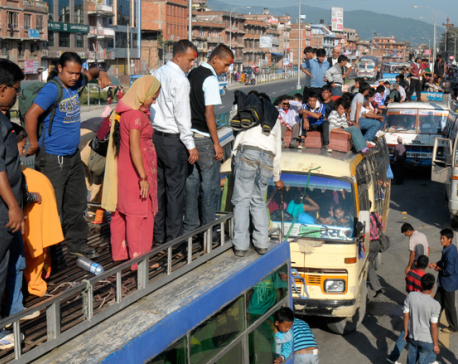 As there are limited number of vehicles plying during Dashain, passengers are seen on the roofs of buses. The passengers have accused bus drivers of overcharging them by saying the vehicle is 'reserved'. Earlier, people had to pay Rs 600 for travelling to Kathmandu from Ajirkot. However, bus drivers are charging us up to Rs 1000 for the same ticket now, according to Narayan Adhikari, a local. Similarly, another local Parasmani Amgain posted a status on social media complaining that he had to pay more money for the ticket while returning from his hometown. Taking advantage of the situation, even trucks and cargo vehicles have started charging hefty fares with the passengers. Finding tickets has been a challenge for everyone. This is the reason why many are obliged to travel the hours-long journey standing in overcrowded vehicles. On Tuesday, many people had to return home empty handed from the ticket counters in Gorkha. Krishna Nepali, a staffer at Gorkha Micro Bus Counter said, "We are doing our bit to facilitate the passengers. But the number of passengers is very high." 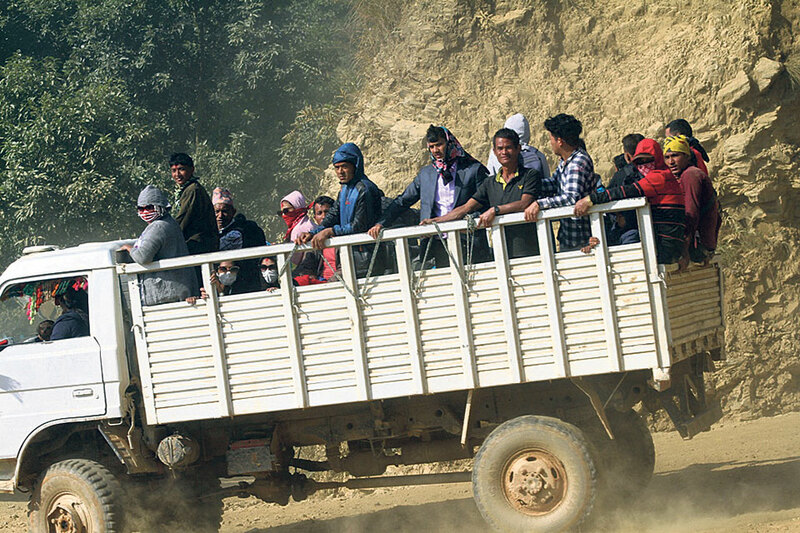 The Transport Entrepreneurs' Committee, Gorkha and Prithvi Highway Bus Operators Committee have been operating passenger vehicles in the district. It has been quite a challenge for around 300 passenger vehicles to carry all the passengers, they say. District Police Office and Traffic Police have tightened security for the proper management of vehicles. They have been making sure that no passenger gets deceived or overcharged. 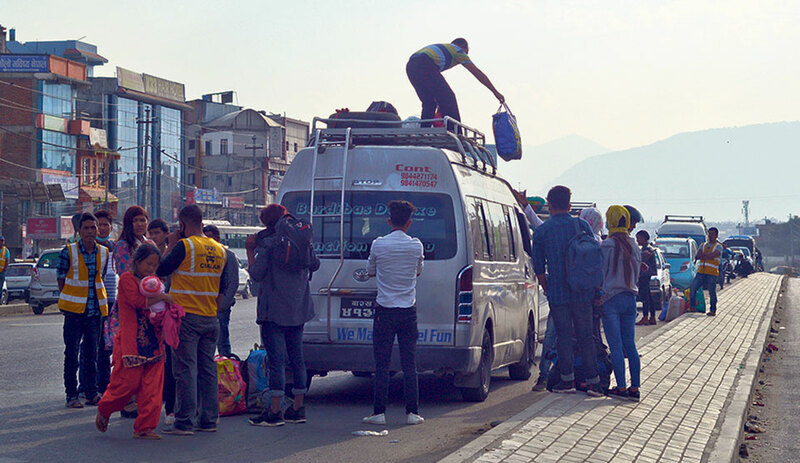 "Stern action will be taken against those who charge extra fare to the passengers," said traffic police chief of the district, Dayaram Paudel.